Recipe originally printed in Bon Appetit Magazine. 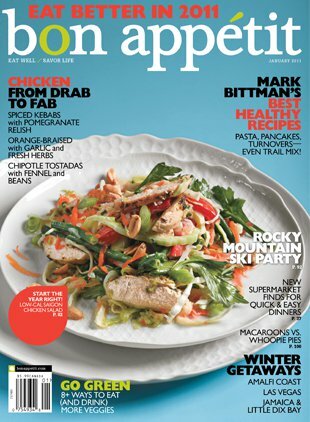 Thanks for featuring our Slow Cooker Chicken Pho recipe! We are reprinting with additional step-by-step photos here. 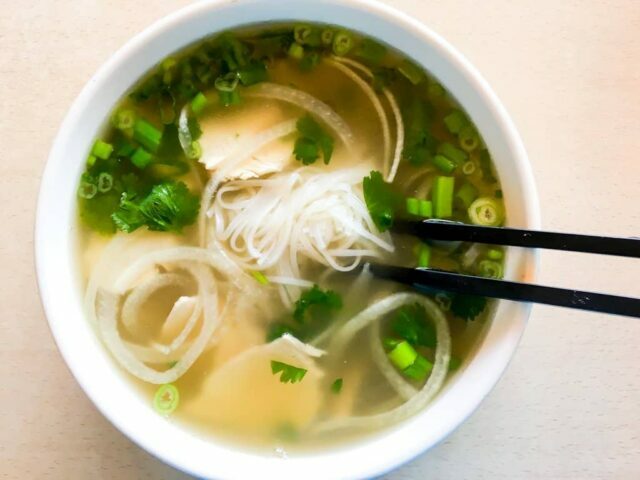 The slow cooker version of Chicken Pho (or Pho Ga) is a bit different than the stove-top version. After testing numerous batches of broth, I found the best combination of chicken parts: 1 1/2 pounds any cut up chicken parts + 1/2 pound chicken wing tips. In fact, the more wing tips (or even feet), the better. The reason why? Most slow cookers don’t hold that much, and my goal was to get maximum flavor from the least amount of chicken. Keep in mind: The bigger the mass (i.e. large chicken parts), the less broth you’ll have in the end. Enter the wing tips (not the whole wing, just the tips–a part that you never eat anyways), neck bones and even chicken feet. 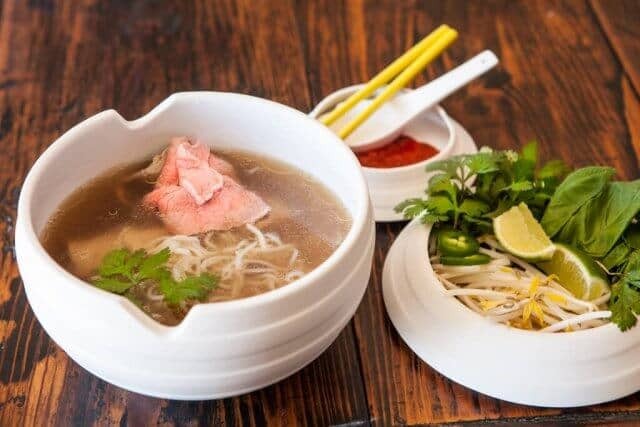 The secret to moist, tender and juicy chicken meat for eating in pho is to separate out the chicken bones from meat. Chicken bones are used for making the Chicken Pho broth. 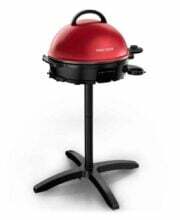 Chicken meat, for eating, needs to be cooked separately, and only for a short amount of time. Overcooked chicken meat is gray, tough, and tasteless. 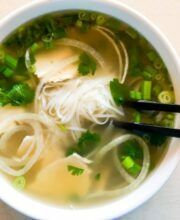 Reserve a boneless chicken breast and/or chicken for eating with your Chicken Pho. You’ll gently cook the meat for 4-5 minutes, just before serving. Then, it’s thinly sliced and divided into bowls. The best type of chicken bones for broth are wing tips, necks and chicken feet. The wings and feet have a high amount of gelatin, which makes the broth richer and more flavorful. For Chicken Pho Broth: use 2 pounds of chicken parts. Of the 2 pounds of chicken, 1/2 pound of that should be wing tips. Most slow cooker have capacity of 7 quarts. The chunkier the chicken, the less room you have left for broth. This is important if you’re trying to make pho for 6 people! A 7-quart slow cooker will make enough Chicken Pho soup for 6 large bowls. Add 2 pounds of chicken bones, whole coriander seeds, half an onion, ginger slices, whole cloves, star anise and a bundle of fresh cilantro to the slow cooker. Add water to cover. Set your slow cooker to high for 6 hours or low for 8-10 hours. 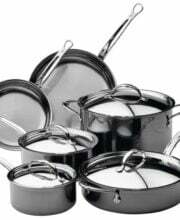 After cooking, use a strainer to remove as much solids as you can. 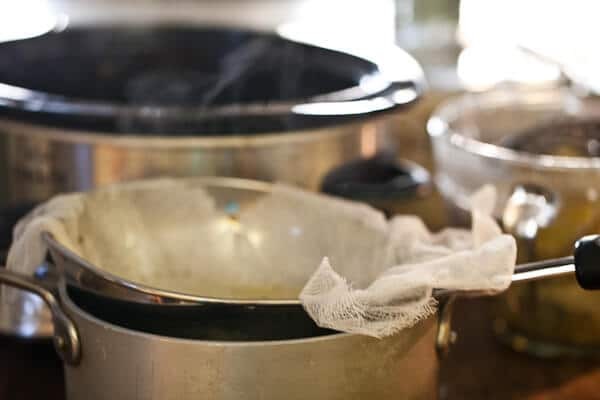 Then, strain through cheesecloth just to ensure that the broth is clean and clear. Straining the broth gives you golden, richly colored, clean Slow Cooker Chicken Pho broth. 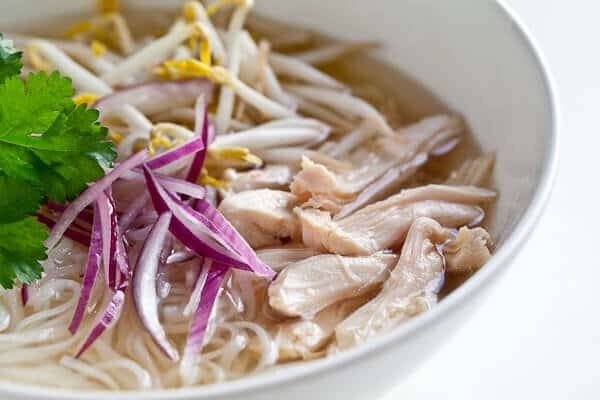 To make Slow Cooker Chicken Pho low-carb, substitute the rice noodles for Shirataki noodles, which are made from yam. Also, Korean sweet potato noodles make a fine low carb option, too! 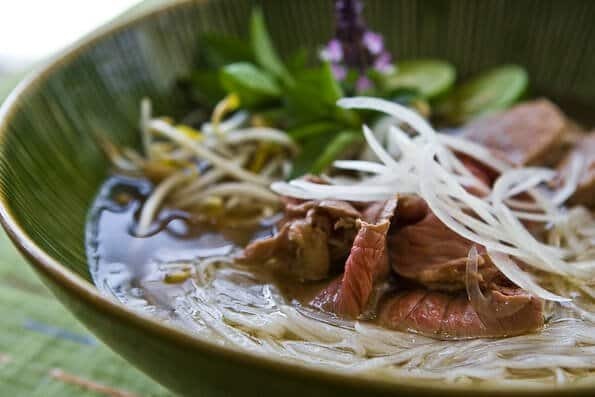 Here’s a recipe for Paleo-Friendly, low carb Vietnamese Pho (beef), and a recipe for Korean Japchae Noodles, which uses the sweet potato noodles. Vietnamese rice noodles cook differently than dried pasta or other Western noodles. 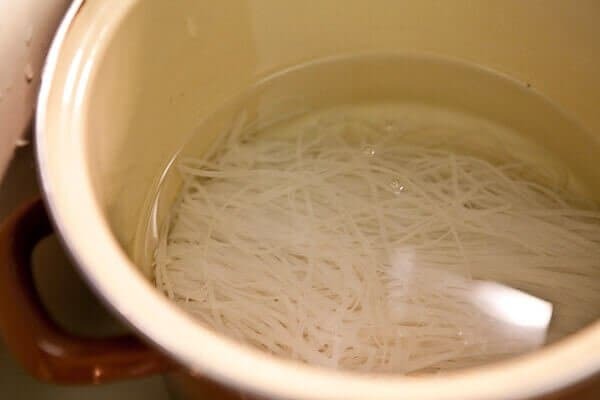 Soak the dried rice noodles in COOL water first then DRAIN. 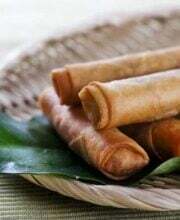 This helps makes them pliable, soft and will cook better. 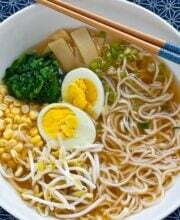 To cook the noodles, bring a pot of water to boil and then lower the cool drained noodles into the hot water. Simmer for 1 minute. After 1 minute, the noodles are DONE!!! That’s it. Don’t overcook the rice noodles, they’ll get too soft and soggy. Here’s an important tip: Don’t cook the rice noodles in the Slow Cooker Chicken Pho broth. I always cook noodles for soup separately, in water, and never in my precious broth. That’s because the dried noodles are starchy and release starch into the water while cooking. That’s why your pasta water is cloudy. You don’t want that extra starch in your soup! 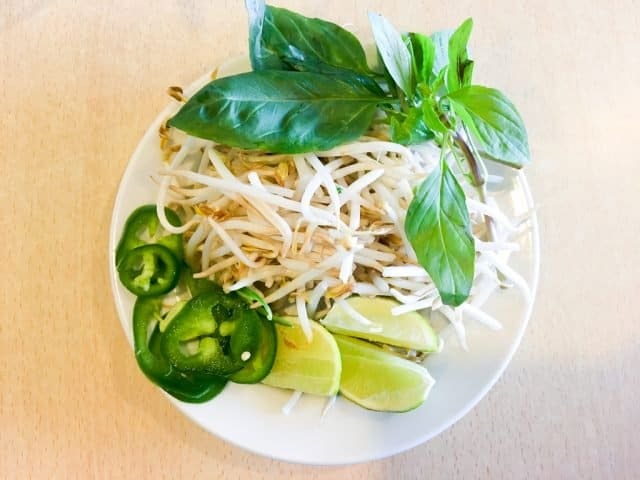 I love garnishing with shaved onions, fresh bean sprouts, cilantro and a squeeze of lime. No Sriracha or Hoisin for me, though many people do enjoy those condiments in their Pho Ga, I think it totally overpowers the beautiful broth. To the slow cooker, add the chicken, onion, ginger, coriander seeds, cloves, star anise, sugar, fish sauce, and cilantro stems. Fill with water to the max level of your slow cooker. Turn slow cooker to high for 4-6 hours or low for 8-10 hours. Remove all chicken and cilantro stems, strain broth through cheesecloth. 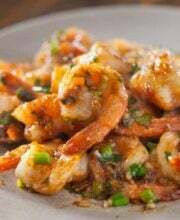 Taste and adjust with additional fish sauce and sugar if needed. If using yellow onions, soak the onion slices in ice cold water for 10 minutes. I find that red onions are milder and do not need soaking. Prepare the rest of the ingredient for the table, including bean sprouts, sliced jalapeño and sauces. Chicken Pho is best when the broth is boiling hot, and the noodles are freshly cooked. When you're ready to cook the chicken meat and noodles, go ahead and put the Chicken Pho broth back on the stovetop and turn the heat to low, so that it's ready. Alternatively, you can return the broth to the slow cooker and turn onto "simmer" if you have that function. 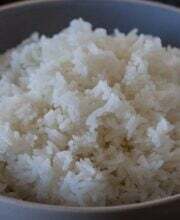 Soak rice noodles in cool water for 10 minutes. Drain. In the meantime, bring a big pot of water to a boil and then turn to low. Add the chicken meat and let cook for 1-3 minutes or until cooked through--timing depends on how thin slices are. Remove the chicken slices, and set aside. Next, add the rice noodles to the water and cook for 1 minute. Remove noodles and divide amongst 6 serving bowls. 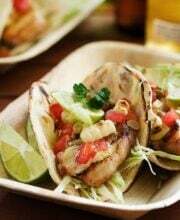 Also, add to the bowls, the chicken meat, green onion and cilantro leaves. Ladle hot Chicken Pho broth into each bowl and serve immediately. To the slow cooker, add the chicken, onion, ginger, coriander seeds, cloves, star anise, sugar, fish sauce, and cilantro stems. 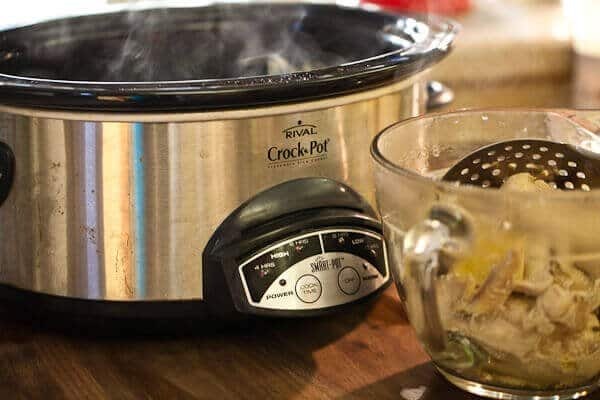 Fill with water to the max level of your slow cooker. 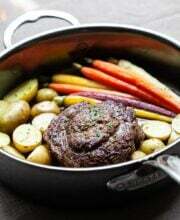 Turn slow cooker to high for 4-6 hours or low for 8-10 hours. Remove all chicken and cilantro stems, strain broth through cheesecloth. Taste and adjust with additional fish sauce and sugar if needed. 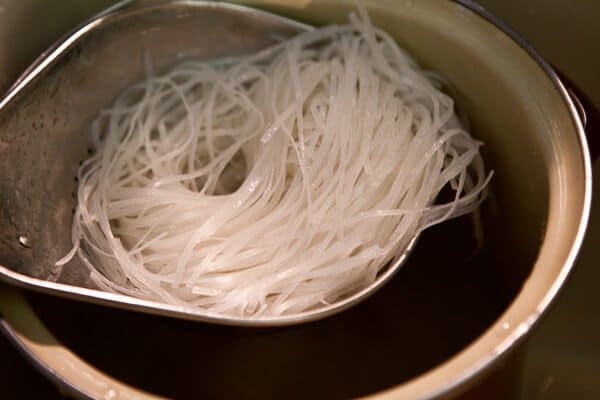 Soak rice noodles in cool water for 5 minutes. Drain. In the meantime, bring a big pot of water to a boil and then turn to low. Add the chicken slices and let cook for 1-3 minutes or until cooked through--timing depends on how thin slices are. Remove the chicken slices. Next, add the rice noodles to the water and cook for 1 minute. Remove noodles and divide amongst 4 serving bowls. 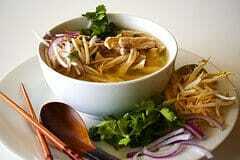 Fill each bowl with chicken slices, bean sprouts, cilantro leaves, red onions and broth. Have the lime, Sriracha and hoisin at table as condiments. Excited to try this recipe Thank you on the tips for the broth. Hi , this is the first time I ever tried the Slow Cooker Chicken Pho recipe. I followed the exact instructions given and it came out to be delicious. made this tonight, so delicious! i completely agree that it doesn’t need the hoisin or sriracha, it’s a lovely, delicate broth. and it made more than expected so i now have some in the freezer. this is my new favorite soup. why isn’t my Pho Ga turning out well? It tastes like water with anise in it, no flavor at all. I followed your recipe. Can you approximate the amount of water you added? I am thinking maybe I added too much. More than likely you needed more fish sauce 🙂 THe amount of water won’t affect it as much, especially in a slow cooker. Recipe was easy and convenient….but can you tell me why soup did not turn out clear. It is a bit too dark for me and smells, not taste like cloves. I went wrong somewhere, disappointed with myself. 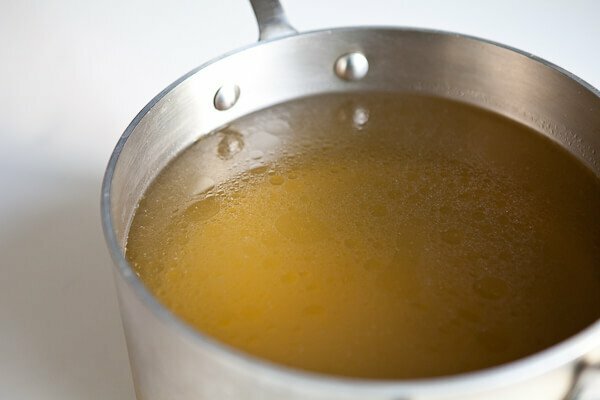 This is a little late, but your broth is cloudy because of the proteins that come out when cooking bone broth. If the water is on a hard boil, this usually comes out as scrum that floats on the top, but eventually it ends up turning your broth cloudy. That’s the reason this broth is strained through cheesecloth. Another method that can help is boiling the bones in water for about 10 minutes, then rinsing them before using them to make the pho broth. 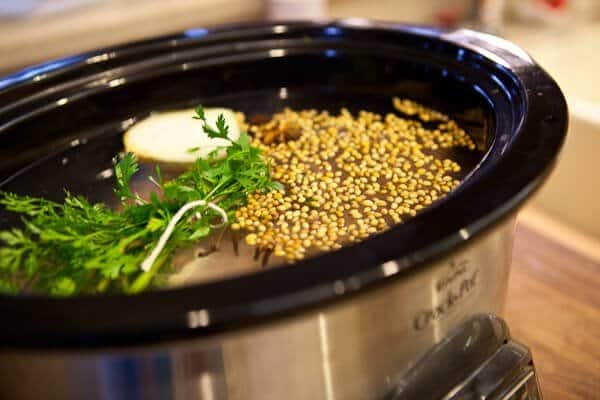 I have never thought about making chicken broth in my slow cooker, but it’s a great idea. And I JUST made a TON of homemade chicken broth yesterday!! Oh well, I’ll have to remember that for next time! I can find chicken feet but don’t know how to clean them. I’ve always wanted a recipe for a soup just like this! I went to a restaurant not too long ago, and they made something similar. Thanks! 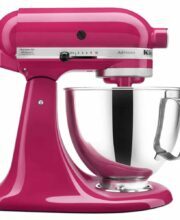 Excellent tips, beautiful recipe! 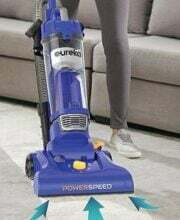 I think I’ll have to give it a go! Thanks for sharing! 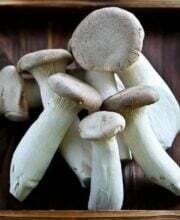 I make a lot of chicken broth, and I’m not afraid of those chicken feet, but just the other day, I thought, wings are cheap at Whole Foods, maybe they will make a good broth. You have confirmed it for me. I did use a few and then on a whim, threw into a hot oven. Guess what. They got crispy and were still good. Your soup is gorgeous and all the tips are wonderful. Great idea for the chicken wings and drumsticks. I can never buy them when they are on sale because nobody at my house would eat them. 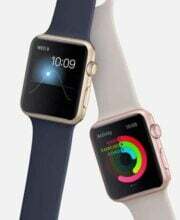 Now I can buy them and make broth. So cool Thanks for the idea. You have been my go-to source for beef pho, and pho ga, and slow cooker beef pho…now it’s like I’ve come full circle! 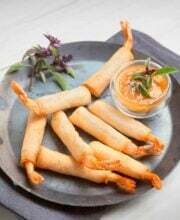 I love that you mentioned chicken feet – I always pick some up when I’m at the Asian grocery. They make great stock – and it gels when it’s chilled, with all that gelatin. So good for you and so tasty! Sounds lovely, Jaden! I was just thinking of making some chicken noodles tomorrow with leftover Sichuan roast chicken – so this is timely. What a flavorful chicken dish! Fantastic! I love the ingredients like coriander seed, cloves, ginger and cilantro when cooking and red onions and fresh bean sprouts when serving. Sounds so appealing! Well, when you put it that way … I have to agree. I’m wishing I had everything I need to come close to this recipe — given that it is snowy and icy and I really want hot soup without venturing out to the grocery. But I’m afraid that I come up short in several essentials. I may get my courage up, or I may just make split pea soup and a loaf of bread. I agree that cooking the chicken breast just a little while sounds like a good idea. Why do you cook the breast and noodles in plain water, though, rather than in the broth? Seems like you could heat the broth up and use it instead of the big pot of water. I like to keep my broth clean — and always cook raw or dried noodles in water instead of the broth. Dried noodles sometimes has extra starch (esp wheat noodles) or possible little itty bitty bugs or dirt trapped. I love the tip for putting the chicken in later… mine is often dry. I am excited to try this recipe.